ePosters - Management of renal masses in an octogenarian cohort: Is there a right approach? 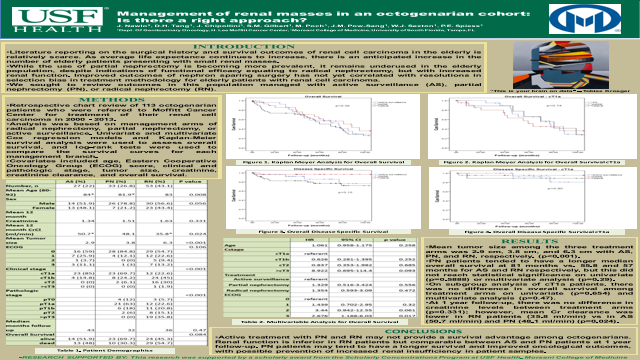 Poster Title: Management of renal masses in an octogenarian cohort: Is there a right approach? Abstract: Intro/Objectives: Although several guidelines outline management options for patients with renal masses, few studies describe treatment strategies and outcomes in octogenarians. We sought to review outcomes in this population managed with active surveillance (AS), partial nephrectomy (PN), or radical nephrectomy (RN). Methods: Data were collected on 113 octogenarian patients referred for management of renal masses at Moffitt Cancer Center between 2000 and 2013. Patients were treated with AS, PN, or RN. Univariate and multivariable Cox regression models measured association of management modality and survival. Kaplan-Meier survival analysis was used for overall survival and log-rank tests were used to compare survival curves. Covariates include age, Eastern Cooperative Oncology Group (ECOG) score, clinical and pathologic stage, tumor size, creatinine, creatinine clearance, and overall survival. Results: Out of 113 patients, 27 (22%) underwent AS, 33 (26.8%) underwent PN, and 53 (43%) underwent RN. The mean age was 83 years (range, 80-92). AS patients had a higher mean age (84 years) than PN patients (81.9 years), but not with RN patients (83 years) (p=0.008). At a median follow-up of 30.6 months (IQR 9.9-56), 13 (48%), 10 (30.3%), and 29 (54.7%) patients died from any cause in AS, PN, and RN patients respectively. PN patients tended to have a longer median overall survival at 81 months versus 55.8 and 57 months for AS and RN respectively, but this did not reach statistical significance on univariate (p=0.588) or multivariate analysis (p=0.29). On subgroup analysis of cT1a patients, there was also no difference in overall survival among treatment arms on univariate (p=0.654) and multivariate analysis (p=0.47). At 1 year follow up, there was no difference in creatinine levels between treatment arms (p=0.331). However, mean creatinine clearance was lower in RN patients (35.8 ml/min) compared to AS (50.7 ml/min) and PN (48.1 ml/min) (p=0.024). Conclusions: Active treatment with PN and RN may not provide a survival advantage among octogenarians. Renal function was inferior in RN patients but comparable between AS and PN patients at 1 year follow-up. for the treatment of small renal masses. References: Hellenthal NJ, Mansour AM, Hayn MH, Schwaab T. Renal cell carcinoma in octogenarians: nephron sparing surgery should remain the standard of care. J Urol. 2011 Feb; 185(2):415-20. doi: 10.1016j.juro.2010.09.071. PubMed PMID: 21167523. Kunkle DA, Egleston BL, Uzzo RG. Excise, ablate or observe: the small renal mass dilemma: a meta-analysis and review. J Urol. 2008 Apr;179(4):1227-33; discussion 1233-4. doi: 10:1016/j.juro.2007.11.047. Review. PubMed PMID: 18280512.